Amazon.com is buying Whole Foods Market in a deal that sent shock waves through the grocery industry and set analysts speculating about the next move in a huge sector that Amazon has been trying to crack for a decade. Amazon.com is about to give “whole paycheck” a new meaning. With its $13.7 billion purchase of Whole Foods Market, the undisputed king of one-click shopping just bought itself a lot of bricks — and a golden ticket into a juicy retail stronghold it has long sought to breach. The deal sent shock waves through other major grocers, making shares for Wal-Mart, Kroger and Costco Wholesale tumble. 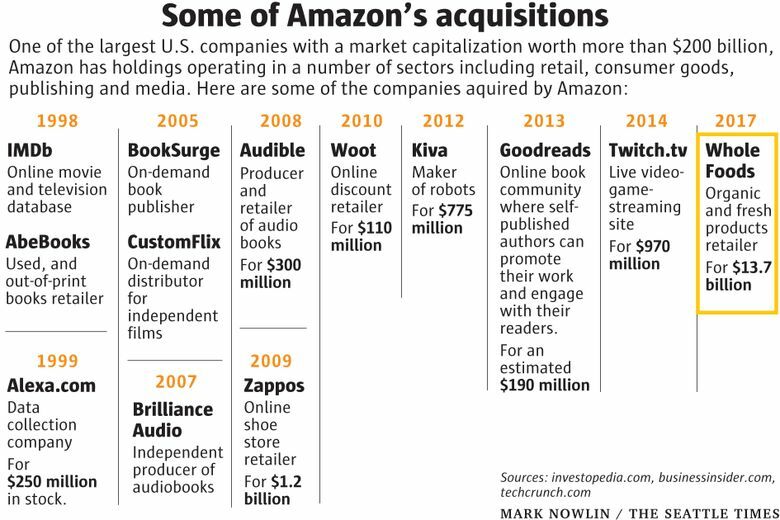 The acquisition, expected to close this year, is more than 10 times what Amazon spent on its next-biggest deal, buying online shoe retailer Zappos in 2009. Amazon workers love Seattle’s Whole Foods. Here’s what some are saying about the bombshell news. The purchase gives the e-commerce giant, which has been experimenting with various physical grocery concepts and online food delivery, an instant footprint of 460 high-end brick-and-mortar stores across the U.S., in Canada and in the U.K. 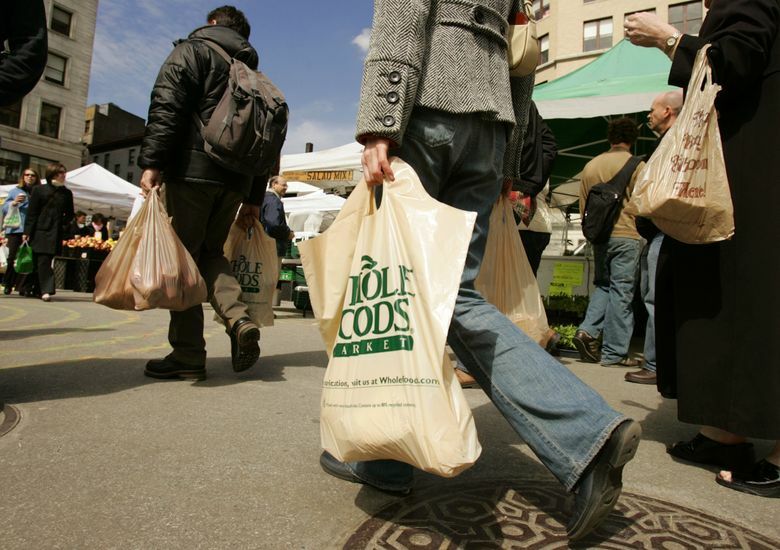 Whole Foods became a household name retailing organic and fresh products, while earning the “whole paycheck” moniker for the lofty prices it charged shoppers. The company has been struggling recently amid stepped-up competition as other retailers, even Costco, jumped on the organics bandwagon. But in the hands of Amazon, Whole Foods could become a potent weapon against archrival Wal-Mart, the world’s largest retailer, which dominates the grocery world and has been stepping up its challenge online. On Friday, Wal-Mart said it would buy Bonobos, a popular internet apparel retailer; last year, it acquired Amazon competitor Jet.com and appointed that company’s chief executive, Marc Lore, to rev up the Arkansas behemoth’s e-commerce operation. News of the Amazon-Whole Foods deal pushed Wal-Mart shares down 4.7 percent Friday, while Kroger’s stock tumbled 9.2 percent. Costco shares were down 7.2 percent to $167.11. Not only competitors are wary. At the Whole Foods store in Seattle’s Interbay neighborhood, reactions among shoppers ranged from dread to curiosity. His friend, Janine Henkel, said that something good could come out of it. Amazon agreed to pay $42 per share for the Austin, Texas-based grocer in an all-cash transaction, a 27 percent premium over Thursday’s closing stock price. The transaction, code-named “Walnut” according to securities filings, will be financed with debt. The breakup fee was set at $400 million. Analysts with RBC Capital Markets called the deal “somewhat surprising,” given the size, but they acknowledged that Amazon has hinted at ambitious moves in new realms that would add a fundamental major “pillar” for its business. The news pushed Amazon’s shares up $23.54 or 2.4 percent, to close at $987.71 Friday. Whole Foods stock jumped more than 29 percent on the news. It closed at $42.68,above Amazon’s offering price, as stock traders speculated about the possibility of a bidding war. Amazon entered the $750 billion U.S. grocery market in 2007 with AmazonFresh, a service that delivers groceries to customers’ homes for a fee. The service is now available in 21 U.S. metro areas, as well as London and in Tokyo, but it hasn’t had the transformative impact of other Amazon businesses. That’s in part because most shoppers prefer buying groceries, and especially fresh foods, in person. The logistics of moving fresh food are also complex. But Amazon kept trying. After all, the grocery market is perhaps the largest untapped opportunity for an e-commerce giant that grew 27 percent last year, said Cooper Smith, who closely tracks Amazon at L2, a research firm. “If Amazon is going to sustain its current growth rate, it has to get into groceries,” Smith said. In recent months, Amazon has deployed various brick-and-mortar experiments with the aim of making people comfortable with the concept of buying food from Amazon, and eventually nudging them to move a big part of their grocery shopping online. Seattle has been the epicenter of that experimentation, which features Amazon’s penchant for automation and tech panache. In December, Amazon opened a store downtown crowded with sensor technology similar to that in driverless cars, allowing shoppers to buy items without going through a register. That remains an in-company test site despite expectations it would open to the public in early 2017. A few weeks ago, Amazon made available to the public two grocery-pickup locations for Amazon Fresh. The locations, in Sodo and in Ballard, have sensors that identify customers by their car license plates. The Whole Foods acquisition offers interesting possibilities for Amazon. Smith, the L2 consultant, said Amazon’s technology and operational efficiency could give Whole Foods’ operating margins a boost. There are also potential synergies from the fact that both companies cater to the same high-income customer base: Many Whole Foods shoppers are also members of Amazon’s Prime loyalty program, Smith said. But there are also perceived incompatibilities. Jeff Green, a retail real-estate consultant, said it isn’t clear to him how the cultures of the two companies will merge. 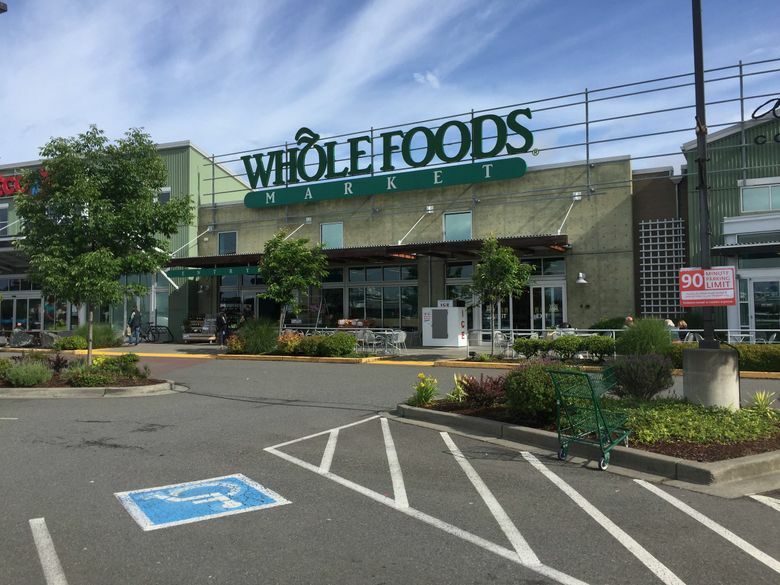 The acquisition would add Whole Foods’ 87,000 employees to Amazon’s bulging payroll, which as of the end of the first quarter had 351,000 people. It’s unclear how much integration there will be in the long term between Whole Foods’ operations and Amazon’s tech-driven juggernaut. Ladd wrote that he expects Amazon to deploy the sensor technology it experimented with in Amazon Go across the Whole Foods system, redeploying staffers into other tasks and increasing profitability. Amazon will also use Whole Foods stores to fulfill online orders, and also to display gadgets such as the Echo or Fire tablets, he predicted. All of this makes the acquisition an existential threat to Wal-Mart. “Amazon just dropped a nuclear bomb,” Ladd wrote. For now, however, it seems not much will change. A person familiar with Amazon’s thinking said the company’s other food ventures would continue, independent of the acquisition. 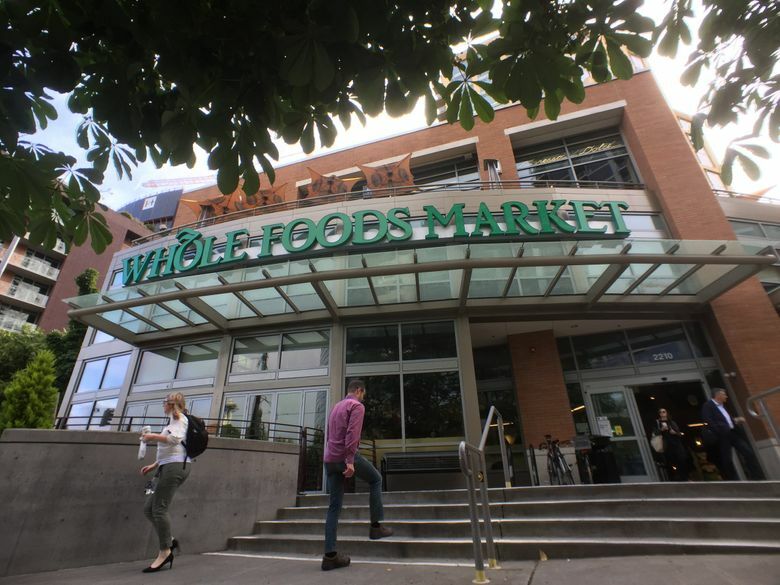 The companies said Whole Foods will keep its brand and John Mackey, its current CEO, will remain in place at the company’s Austin headquarters. Seattle Times business reporter Janet I. Tu contributed to this story. Ángel González: 206-464-2250 or agonzalez@seattletimes.com.